July 10, 1962, marked the birth of satellite communications. Exactly 50 years ago on this date, the Telstar satellite commenced its journey into space from Cape Canaveral and became the first ever active communications satellite. It carried the first live trans-Atlantic TV broadcasts. The relationship between communities of military engineers and operators have traditionally been tense even though they heavily impact on one another, and communications between the two groups are more important than ever before as the nature of operations evolves. The influx of new technology and changing battlefield requirements have presented new challenges for operators and engineers and it has never been more important for both parties to work together to achieve the desired capability. Both groups must keep the higher-level concept of operations planning at the forefront of their minds in order to successfully collaborate. In 2002, Jay Hennig was named president of Moogs Space and Defense Group. Part of landing that job probably had to do with the fact that he had built relationships with so many customers from years as a sales engineer and had worked in the space industry from 1987 to 2002. OPS: Enhanced Mobile Command In A Reduced Budget Environment, by Mark Lueker, Director, Advanced Products Group, 308 SYSTEMS, inc. Whether you were there or not, the images of the devastation in South Asia created by the 2004 tsunami are unforgettable. Wreckage was everywhere. The large numbers of responders in Indonesia, where the tsunami wrought the worst damage, worked around the clock in their search, recovery and rescue efforts. 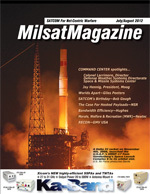 Hosted payloads (HPs) are unique and highly viable solutions that address shortfalls in civil and military agency capabilities. They could be especially important given tight government budgets but continued mission-critical requirements across the globe. Although the industry is largely in agreement that little has and will likely take place in the short term in the form of HP deployments, it is certainly not faltering as a viable market proposition over the long term. It is thus useful to examine the HP business case for key market segments and the benefits to the satellite operator, satellite manufacturer and hosted payload client over the medium to long term. Information from the analysis below is extracted from NSRs industry leading research report, Hosted Payloads on Commercial Satellites, 2nd Edition. Jason Andrews, president and CEO of Spaceflight Inc., says he plans to leverage the ESPA ring concept to meet his business plan objectives. Andrews company offers a new business model for the cost-effective launch of small spacecraft. Morale, Welfare and Recreation (MWR) programs are a key part of Government and Defense operations. MWR networks are designed to support remotely deployed defence personnel, civilian employees, ship crews and their families. Satellite communication plays an important role in MWR programs due to the fact that government and defence operations are mostly situated in remote locations or in areas suffering from man-made or natural disasters with no terrestrial connectivity.